Flights allowing, we will be presenting a poster at the International Forum on Quality and Safety in Healthcare conference this week in Nice. 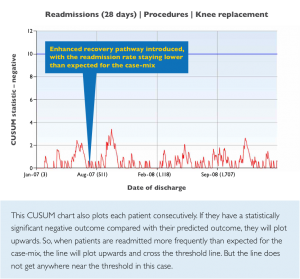 The poster details how Dr Foster software can be used to analyse the effect of introducing an enhanced recovery pathway. The International Forum is hosted by the IHI and BMJ, and is widely recognised as the largest and most important healthcare improvement conference in the world. For more details on the conference program and to go to the conference home page, click here. 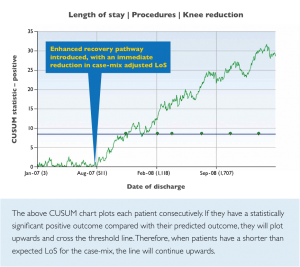 Below are graphs from the poster which show how we have used the Dr Foster CUSUM methodology to produce case-mix adjusted cumulative summary charts to evaluate the “real” effect of the introduction of an enhanced recovery pathway. As you can see, length of stay has reduced with no negative effect to re-admission rate. Further evidence that enhanced recovery can be a highly effective and safe way to reduce length of hospital stay.